Taco Bamba's grilled Mexican street corn ($4) impresses with its crisp freshness and intense seasonings. If warm weather has you in search of new Mexican food and cocktails, look no further than the recently opened Taco Bamba, located at 777 I St. NW. Taco Bamba is a quality, fast and casual restaurant serving up dishes like tacos, tortas and nachos from chef Victor Albisu. He previously ran Del Campo, a Latin steakhouse, in the same location before splitting the space into two restaurants. The Chinatown Taco Bamba opened last month and joins two locations in Virginia, and a high-end, sit-down Mexican restaurant by the chef will open next door this month. At Taco Bamba, you can head right up to the counter and order food yourself without having to wait to dig into flavorful dishes while seated in a funky red metal chair. The rock ‘n’ roll posters scattered on the concrete walls are spray-painted with the restaurant’s logo and emit a hip, offbeat vibe. A huge painted hand that’s gripping a taco and an expletive-laden bathroom sign about burritos adds to the edgy atmosphere. If you prefer a full-service experience, you can head over to the bar and take a seat. The restaurant serves food and cocktails, along with breakfast options, from 8:30 a.m. to 10 p.m. on weekdays, 10 a.m. to 11 p.m. on Saturdays and 10 a.m. to 10 p.m. on Sundays. The menu is vast and offers a wide array of authentic Mexican dishes at prices that won’t break the bank. A few of the tastiest dishes include the El Bacho nachos ($8), the Al Pastor taco ($3.50) and the Crispy Tinga tostada ($8). The no-frills eats are served in paper boats or wrapped up in tin foil, but flavors burst from the containers and make up for a lack of presentation. 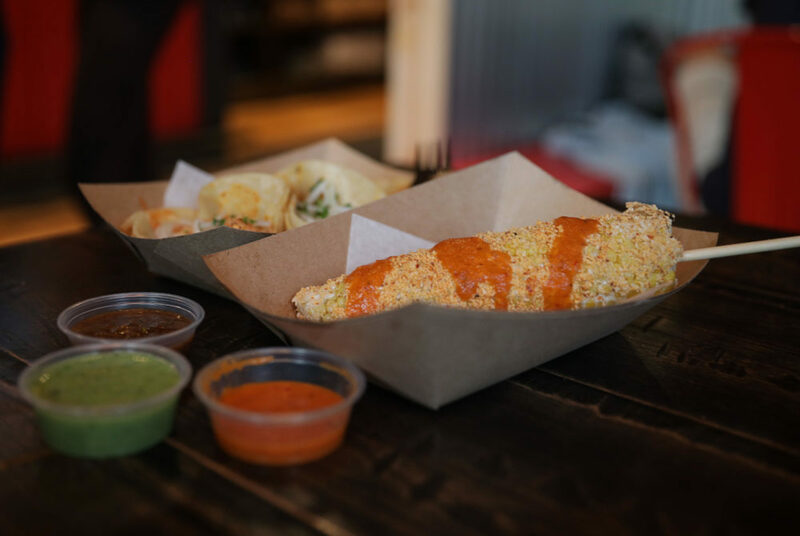 Aside from the tortilla-heavy choices, the grilled Mexican street corn ($4) impresses with its crisp freshness and intense seasonings. The grilled Mexican street corn offers a combination of sweetness from the corn and heat provided by red chiles that are sprinkled on top. You might need to take a break from your spicy snack with a sip from a margarita to cool off your tastebuds. The red chile spice is mixed with mayo and spread over the ear of corn. The sauce gives the corn creaminess, and a bit of lime zest adds a dash of acidic flavor that complements both the sweet and piquant flavors that pop out with each bite. To top it off, a layer of cotija cheese melts atop the spices and mayo to keep everything together. Every bite of the corn is a satisfying take on the traditional summer treat, which makes the grilled corn a perfect dish for sunny weather. Pair the corn as a side dish with your favorite taco, or walk out with a stick of corn in each hand.